Are you a bridge builder? | Burning or building bridges in the community? The bridge builder award is pretty simple really. Think of a blogger or web writer you know who, in their connections with others, really has a heart for building bridges between all different types of people. Someone who leaves you with a little more hope, humor, humility, happiness. Are you a bridge builder? Do you know a bridge builder? Nominate them here. The first rule is to write 3 ways you build bridges between yourself and others. 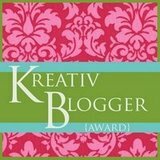 The second is to nominate 3 of your favorite blogs/writers for this award. I think I will work on writing this up. If you have been nominated, email me and I will happily send you the code for the badge. Who are some of the amazing individuals who have already been nominated and awarded as Bridge Builders? You know, in all honesty, some days I think I am….and other days, quite clearly not. I believe in education, I believe in making sure they know who we are and where we’re at and not hiding in the shadows….but as I’ve aged, I have no tolerance for rude comments or hatefulness. And there are just simply days that I don’t feel like being the educator any more. I’d rather be the one who says point blank “that’s not acceptable in the year 2009.” So, sort of a builder here…..sorta not. Thank you so much for your note on my blog! I’d LOVE to write a few blogs on this theme. I’ll have to do in September after I finish writing up my thesis, though :S (See my most recent blog). Is that okay? I think it is SO important to look for ways we can bring different parts of communities together. In some ways I think that’s what I invest most of my time doing since my “expertise” is in intercultural and inter-religious communication! I think that this is a great idea. I suppose that you could summarize what I’m trying to do with my blog as building bridges. 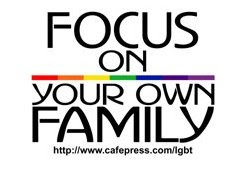 My goal is to show people all over the world that LGBT folks are normal people, just like them. But if I’m saying that, then it *has* to work both ways: I have to be telling LGBT people that those folks who harbor misconceptions about them are normal people, just like them. If circumstances had been a little different, you or I could be just like them. We’re all human. And we need to respect and talk to each other. I’m probably missing something right in front of my nose, but how do we vote? I have someone in mind. Thanks for your transparent thoughts on this Arnie. I can relate to how you articulated that. That IS still being a bridge builder. Some days we have more energy to bring others along on the bridge with us… others? That is how life is. HUGS! I look forward to your new posts! Thank you again for what you do Hugh! How you vote is this, when you put the badge up you nominate someone in that post (then send the suggestion to me). 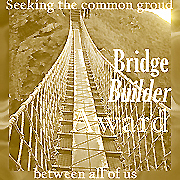 Note from bridgeout: Liz at http://gracerules.wordpress.com who was nominated for the Bridge Builder Award sent the following to me via email It is too good not to share here! I form meaningful relationships with people who believe differently than I do. We may disagree about religious beliefs or politics or any number of things but there is always some common ground – people just have to be willing to take the time to discover that common ground. That doesn’t mean that we ignore our differences – but it seems that once we have a relationship and have discovered some common ground we can move on to having civil conversations about our differences. I do my best to live out my beliefs but at the same time I am aware that I could be wrong about what I believe. This helps me to have conversations rather than debates and to really listen to what other people are saying instead of always trying to think of what I am going to say next to defend my position. It also has made me realize that I can learn a lot from people that I least expected to learn from and I believe that it has created a more teachable spirit in me. I share my doubts and questions about what I believe. I think if we are all honest we all have some doubts and questions about the things that we believe. I think we create a better space for connecting when we are willing to come out of our corner and admit that we don’t always know why we believe some (or a lot) of the things we believe or that we are unsure or have questions. I fail at all of these things at times – I am a work in progress – but when I fail, I get up and try again, and again. Thanks again, so much, for offering me the Bridge Builder Award – I am humbled and thrilled. What a lovely idea, and thank you by the way! She is also responsible for turning our allies blue on twitter! You are very welcome Rebecca! 🙂 All three are excellent nominees! Thank you! I will get on that! 😀 These are all wonderful bridge builders! with the daughter I put up for adoption. I have been meaning to take you up on this *forever*. I ought to be spanked for having such bad follow through! Chuckling… no spankin’ here Lindsey. 🙂 I remain grateful for your heart you share and the bridges you build! I should get to it tonight or tomorrow, though. Thank you Kathy for the light and grace you share on your blog! Just visited there again this morning. Well, I finally got my entry done. How long until voting ends? I’d like some time to cast my second and third votes. Oh, by the way, those Melissa Etheridge lyrics are fantastic–exactly what I’m talking about! Hugh, this was just right. I know how you labored over what you wrote, and that makes it all that much more authentic! Thank you again for caring enough to put yourself out there and be a bridge builder. I think it is more of a journey than a destination, so we can all be “becoming” better bridge builders each day! I agree with your 1st nomination of Jude. She has been nominated above as well! And please, take as much time as you like for nominations– there is no time constraint and truthfully, no limit on nominations… considering I want to encourage as many connections between bridge builders as possible! 1. I avoid making assumptions about other people’s motives and beliefs when engaging in conversation about sexual identity, particularly with those who may have different views than me. So many unnecessary walls and a basic lack of kindness develop when we automatically see others as “opponents” rather than human beings. Most people have good reasons for thinking and acting as they do. I try to understand where someone else is coming from and put myself in their shoes. It doesn’t mean that I will necessarily come to an agreement with them, but it does mean I treat them like a fellow human being despite differences in worldviews. 2. I make an effort to attend events that are gay affirming. For example, when I wanted to watch the documentary, “For the Bible Tells Me So”, I didn’t just rent it and watch it at home; I went to a screening at a local LGBT center. I enjoyed engaging with people there and hearing their thoughts on the film. 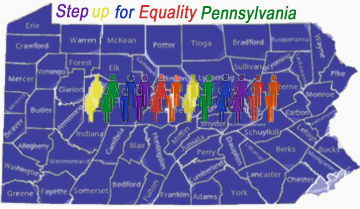 I also participated in the gay-affirming film, “God and Gays: Bridging the Gap.” And awhile back, I attended a National Gay and Lesbian Task Force annual convention–just to see what it was like. Sometimes Christians, even those who consider themselves “ex-gay” tend to put up fences between themselves and the gay community.Those in the gay community put up their own walls too. I understand that–it can be scary and vulnerable to engage with those who disagree with us especially when its on an issue that is so close to one’s heart. But, I believe that taking the risk to do so is immensely valuable. 3. 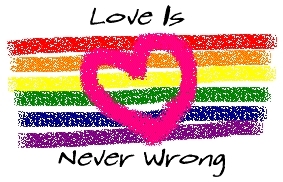 I attempt to educate those in the Church about sexual identity through speaking and writing. I desire to expose inaccurate and harmful stereotypes about gay people and counteract the harm that has been caused by the Religious Right culture war. Too much misinformation has been given to the church on this topic over the last 30 years and we are just now beginning to dismantle the consequences of that. Those in the Church can still maintain their faith-based sexual ethics, while at the same time treating gays and lesbians with dignity and respect. A big part of making this happen is dispelling the harmful myths that gay people are mentally ill, pedophiles, drug abusers, etc I try to do my part in correcting misconceptions by speaking and writing.